The great general developed throat cancer from those thousands of cigars, and the end wasn’t comfortable. After his two terms as president, he and his family traveled the world for a year and a half. He and Julia lived their final years in New York City. Realizing he needed to provide financially for his family, he wrote articles on Civil War campaigns for New York magazines. Diagnosed with throat cancer a year or more before he died, he kept it a secret from Julia as long as he could. We could imagine the pain and suffering he endured, not able to swallow without discomfort. 1885, July, he died with his family around him. The top picture shows him on the porch of his New York home, writing daily to complete his memoirs and autobiography. He died a month after this photo was taken. The young, healthy general that his men and the country remembered. Eventually he began writing his autobiography. Mark Twain helped Grant land a book deal for somewhere around $450,00, millions in today’s dollars. He was buried temporarily in a NYC grave, but a movement began to build a special and fitting burial site. Grant wouldn’t have wanted anything huge and overdone, but that’s what happened after his death. Money raised from around the country came from all segments of society, most noteworthy from soldiers who served under him or simply from those who respected him. The dollars, five dollars, and ten dollar bills added up. 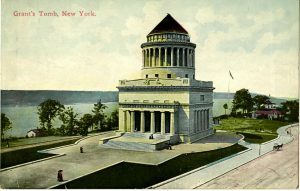 The result can be seen below, Grant’s Tomb. He was entombed here in 1897, and years later Julia they laid next to him. My wife and I toured this site on a NYC tour, a massive granite building on the upper west side. Impressive site. The Hudson River is in the background. 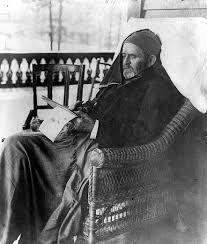 General Grant needs to be respected for his duty in ending the Civil War. He had one purpose, to end the war and whatever it took to do so. Thanks for this historical tidbit! Thanks Brad. I’ve been to Vicksburg and Shiloh where he played a role. Quite a special life. The photo of him at Cold Harbor (healthy photo) is one of my favorites, but at CH he 2nd guessed himself because he sent his troops into the carnage of Confederates hunkered down and dug in in trenches. I visited the site once, not a lot there but quite a story. 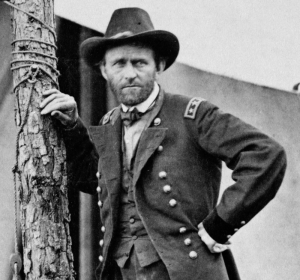 Just like Lee regretted Gettysburg and Pickett’s Charge, Grant regretted CH. And for those who say trench warfare began in WW I, not true. Granted, there was not a lot of TW in the Civil War, but there was some, esp. in the 2nd half of the war when Con. troops couldn’t rush directly at the Union soldiers. Did you see Cold Mountain? That scene in the beginning was an attempt by the North to dig under the Southern camp and blow it up. I saw the CRATER in VA, and it’s still there. Good to hear from you, Brad. I want to do a post on John Sedgwick and his death. Have you heard about him?